TEAM COLORS: Royal Blue Jerseys and Skirt Royal Blue Shin Guards Bel Air High School (Turf Field) 100 Heighe Street, Bel Air MD 21014 All home games played at Bel Air High School will be played on the stadium turf field. Please remind your teams that only water is allowed on the field! Directions to Bel Air High School 95 N Take the MD-24N exit 77A toward Bel Air Turn left onto MD-24N Turn Right onto US 1 BR/Baltimore Pike Turn right onto Kenmore Ave. MD 924S Bel Air High School is on the right. From the Beltway take exit 27 Dulaney Valley Road/Rt 146 N. Stay on Dulaney Valley Road and bear left at the fork /stoplight at Jarrettsville Pike. Continue on Jarrettsville Pike to Jacksonville Elementary School - . Spectators/officials can park either in the school parking lot or go just past Hillendale Heights Rd. and park at tennis court parking lot. Fields are at the bottom back. From the Beltway take exit 27 Dulaney Valley Road/Rt 146 N. Stay on Dulaney Valley Road and bear left at the fork /stoplight at Jarrettsville Pike. Continue on Jarrettsville Pike past Jacksonville Elementary School and continue into Jacksonville and bear right onto Sweet Air Rd./Rt. 145. Proceed about 1/2 mile to Sweet Air Park on the right. Field hockey field is closest to Sweet Air Rd. Parking is right at the field. Bathrooms are in the building. 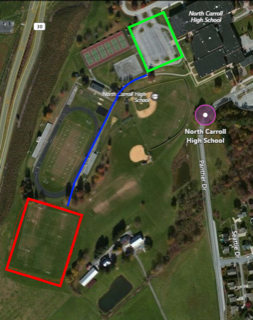  There are two parking lots with access to the turf field. One is located off of Hilltop Avenue and one is off of Valley Road. Please DO NOT leave any valuables in your car when parking at these lots!!! Rte I-695 to exit 12C; West onto Wilkens Ave; right at 1st light (Valley Rd. ); right at stop sign; 100 yds turn left. TEAM COLORS: Navy Jersey Navy Skirt Lime Green Socks Carroll Community College 1601 Washington Rd. Westminster, MD 21157 Directions: From Howard County - From 70 - 97N, turn left onto Rt. 32 (Washington Rd). College is on right within a half mile. From South - Rt. 795 North, exit to right on 140 W, turn left onto Rt. 97 S (signal with Popeyes on right, Pet Smart on left), turn right onto Rt. 32 (Washington Rd). College is on right within half mile. Take the 3rd exit (Padonia Road). At the end of exit bear right onto Padonia Road. Continue straight on Padonia Road for approximately 4 miles and Dulaney High School is on your right. ( you will pass over York Road (light) and two more lights before getting to Dulaney High School. Take 3rd exit Padonia Road. At the end of exit, bear right onto Padonia Road. Go to your 3rd light which is York Road and take a left onto York Road. The 5/6 and 7/8 graders play on the Upper field but use the same parking lot. Port-a-potty is located next to basketball court. TEAM COLORS: Royal Blue Jerseys w Pink Logo Royal Blue Skirts Royal Blue/White Striped Socks SPARROWS POINT HIGH SCHOOL Turf Field 7400 North Point Rd Baltimore, MD 21219 NO FOLDING CHAIRS OR BENCHES ALLOWED ON TURF AND WATER ONLY - NO GATORADE!!! TEAM COLORS: 5th/6th & 7th/8th Red/White Reversible Jerseys Blue Skirts Navy w/White Stars Socks CLINIC & 3rd/4th Navy/White Reversible Jersey Red Skirts Navy w/White Stars Socks Effective Immediately ALL 5th/6th and 7th/8th GAMES WILL BE PLAYED AT OLD LIBERTY PARK 212 Old Liberty Road Sykesville, MD 21784 LIBERTY HIGH SCHOOL 5855 Barthalow Rd Sykesville Md Directions: From 695; Take I70 West to Route 32 Towards Sykesville. Go through the light at Liberty Road and Route 32. Take a left onto Barthalow Road. Liberty High will be on the right just over the Hill. From Westminister: Take Route 32 towards Eldersburg then a right onto Barthalow Road. Liberty High School will be on the right just over the hill. HODGES PARK- (Lower fields) Directions: From 695 -Same directions to Liberty High School, just go past the high school, go through the 4 way stop which is Johnsville Road and then make a right onto Hodges Road. At about 300 yards, before the substation make a left into the gates into Hodges Park. Follow the road all the way back into the parking lot. Fields are on the lower portion behind the soccer goals. From the north and east: 1-95 South to I-695 West. Take exit 23 North (Falls Road). At second traffic light, turn left on Greenspring Valley Road. Proceed five miles and turn right on Garrison Forest Road. The school is six-tenths mile on the left. From the south and west: I-695 west and north (towards Towson). Take exit 21 North (Park Heights Ave) and turn left at the end of the exit ramp. Proceed one and one-half miles to traffic light. Turn left on Greenspring Valley Road. Proceed one and four-tenths miles and turn right on Garrison Forest Road. The school is six-tenths mile on the left. Directions: I-695 exit 23 B Falls Road. Follow Falls Road North. At third traffic light (at Seminary Ave) turn left into the school. Hereford Rec will be hosting all MYFHL home games at the Genesse Valley Learning Center in Parkton Maryland. This facility is privately owned, and the property owners are requiring that we, as a program, enforce the following rules outlined below in order to assure the safety of participants and spectators. 1. No pets allowed. Persons entering with pets will be asked to leave the facility. 2. No parking on Rayville Road. Parking allowed in parking lots only. 3. Use gate areas for access and egress. No climbing of fences. 4. Individuals are restricted to the hockey field areas. No one will be permitted in the woods, ropes course, lake or golf area. Genesee Valley is providing us with excellent quality playing fields in order to enhance your childs enjoyment and safety. We would like to continue our relationship with Genesee Valley in the future, and we thank our participants and spectators (both home and visiting ) for adhering to the above outlined rules. From Northbound I83: Turn LEFT (west) at the top of the exit (traffic signal). From southbound I83: Bear RIGHT (west) at the top of the exit, and merge with westbound Middletown Road traffic. Proceed westbound on Middletown Road for 2 miles and turn LEFT on Rayville Road at Wallys Store (Citgo). Proceed on Rayville Road for 0.7 mile and turn LEFT into the Genesee Valley parking lot. 83 North to Exit 27, Mount Carmel Rd. Turn right onto Mount Carmel and follow to York Rd. Follow for approximately 1 mile. Turf field is the third entrance on the right- on the hill. Take Exit 20 (Route 140/Reisterstown Road) north one mile to the intersection of Reisterstown and McDonogh Roads. Turn left at the light onto McDonogh Road. Proceed about 2 miles to the Lamborn Road entrance (at the light) and make a right. Proceed to the end of the road and turn left- follow the road around to the fields. Take Exit 4 (Owings Mills Boulevard) and bear right off the exit to the Town Center/Owings Mills Boulevard. Proceed through two traffic lights until the road ends. Turn left onto Lyons Mill Road, continuing to the traffic light. Turn right onto Painters Mill Road, then left at the next light onto McDonogh Road. Go to the Lamborn Road entrance (at your first light) and make a left. Proceed to the end of the road and turn left- follow the road around to the fields. TEAM COLORS: Black/Red Reversible Jersey Black Socks NORTH CARROLL HIGH SCHOOL 1400 Panther Drive Hampstead, MD 21074 ALL 3rd/4th GAMES All remaining grade 3/4 home games for North Carroll Storm will be on the back field (behind the track/stadium/softball field) at North Carroll High School. Directions from points west of the intersection of White Marsh Boulevard (Rt.43) and I-695: From the Baltimore Beltway take exit 31C for White Marsh Boulevard east. Continue on White Marsh Boulevard for approximately 3.5 miles and make a left onto Honeygo Boulevard. Proceed north on Honeygo Boulevard for approximately one mile and make a right into the park entrance just past the overhead pedestrian bridge. Directions from points east of the intersection of White Marsh Boulevard and I-695: From the Baltimore Beltway take exit 33 for I-95 north. Continue on I-95 north for approximately three miles and take exit 67 for White Marsh Boulevard west (towards White Marsh Town Center). Proceed to the first stoplight and make a right onto Honeygo Boulevard. Follow Honeygo Boulevard north for approximately one mile and make a right into the park entrance just past the overhead pedestrian bridge. Directions from Harford County using Belair Road. South on Belair Road. Left at Honeygo Boulevard. Follow Honeygo Boulevard past Joppa Road and make a left into the park entrance just before the overhead pedestrian bridge. GAMES WILL BE PLAYED ON TURF FIELD IN THE STADIUM. No food. This includes gum, fruit, team snacks, etc. From points South: Take I-695 to Exit 19 (I-795 Northwest Expressway). Take I-795 to Exit 7A (Franklin Boulevard East). Proceed through first traffic light and then turn left onto Owings Court (if you hit second traffic light on Reisterstown Road, you've gone too far). From points North: Take Route 30. Route 30 becomes Route 140 (Reisterstown Road). End at 12000 Reisterstown Road. Black Socks with White Polka Dots. 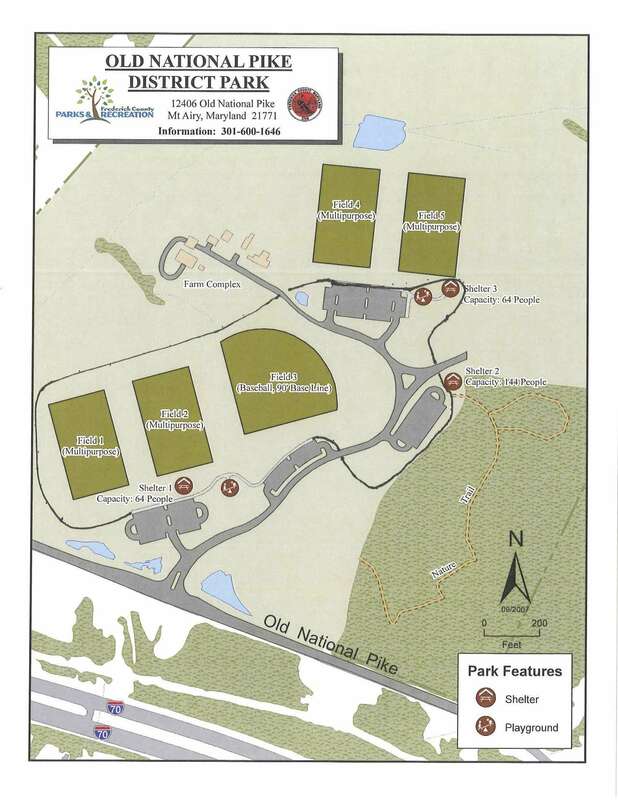 3rd/4th teams play home games on Field #10 and #11 at Western Regional Park. Turn right onto Carrs Mill Road. Park entrance is on the right.